How many hours do you spend seated at your desk each day? If you're like most U.S. office workers, it's about eight sedentary hours of clicking, typing and leaning in to read the computer screen. Day after day. But with a better office setup, workers enjoy improved comfort, motivation and well-being, according to the Chartered Institute of Ergonomics & Human Factors. And you might imagine how that impacts employers too: fewer absences, a more productive workforce and happier employees overall. By following a few ergonomics in the workplace tips, any office — big or small — can make that happen, including yours. What Is Human Factors Ergonomics? Put simply, ergonomics (also known as human factors) is the study of the way humans work together — from the strategic design of office environments to technology systems that make the most of a person's talents, limitations and needs. Though you might think of special keyboards or lumbar chairs when you hear the term ergonomics, the practice has actually been around long before modern-day office spaces. In fact, workers from the Industrial Revolution cooked up all kinds of ways to stay comfortable throughout grueling days of labor — from standing desks to raised work surfaces. Fast forward more than two centuries, and the science of ergonomics has become so prominent that entire organizations have emerged to advance human factors goals, including the Human Factors and Ergonomics Society and the International Ergonomics Association. Thanks to that prominence, the philosophy of human factors has gotten more organized too — and experts have categorized ergonomic needs into three different (and equally important) buckets: physical, cognitive and organizational. Physical ergonomics optimizes a person's interaction with the physical world to make work more comfortable and safe. Cognitive ergonomics accounts for a person's mental health and capabilities to make work less stressful and more effective. Organizational ergonomics looks at teams, systems and processes as a whole to help make work more efficient and successful. The most ergonomic-friendly work environments accommodate workers in all three areas, considering how physical, mental and systematic factors play a role in a team's performance, well-being and success. Focus on posture and joint improvements through ergonomic upgrades, such as standing desks and adjustable monitors. Accommodate repetitive movements — such as mouse clicking or taking phone calls — with optimized equipment, like ergonomic mice or headsets. Think through workplace layout for better traffic flow between offices, conference rooms, break rooms and restrooms. Designate special areas or times for employees to socialize together. Improve professional development opportunities and trainings so employees can approach work more confidently. 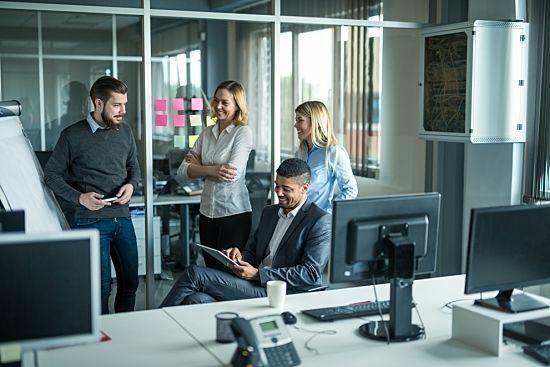 Enable flexible schedules or consider cutting hours altogether for employees whose bandwidths are stretched thin, and you might be surprised to discover higher productivity rates. Incorporate improved technologies that foster more collaboration — from enterprise chat software to videoconferencing. Implement quality control methods to supervise workforce performance and better inform future improvements. Regularly review reporting structures and hierarchies to ensure efficiency and effective communication across departments. That said, it's clear that ergonomics isn't just one thing. For the ideal ergonomic-friendly setup, companies must account for not just the physical human factors — but the mental and organizational ones too. After all, you can have the most ergonomic collection of chairs, work spaces and office design elements, but if the employees who use them are burnt out or disconnected, what benefits are you really providing?